Preschool children are often bewildered by their parents’ separation and divorce. Wallerstein and Kelly (1980), reported that observation of children during the first year after parental separation showed preschool age children lack the cognitive sophistication to understand the meaning of divorce. As a result, they experience a great deal of confusion when one parent departs from the family home. This may create fear in a young child who doesn’t comprehend what is happening. For example, a child may become fearful of losing the other parent as well. A preschooler may wonder, “Who will take care of me?” or “Do my parents still love me?” It is common for them to have an overwhelming fear that both parents will abandon them. In addition to their fear of abandonment, young children tend to worry about how their food and shelter will be provided, and seeing the other parent. Besides their fearfulness, preschoolers may exhibit other emotional behaviors. The most usual way for a young child to express their pain and distress is through exhibiting anger. Hitting, kicking, and throwing tantrums are common ways for the three to five year old to express anger. In addition, distressed preschoolers may show sadness, withdrawal or lack of energy. The young child may reach out to their parents for nurturing, seem emotionally needy or even “clingy”. Dramatic behavior, such as tantrums, may be an attempt by the child to garner the attention of both their parents with hopes of reuniting them. 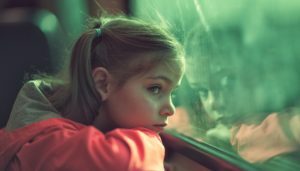 When reacting to parental separation, a child between the ages of three and five will often demonstrate their distress by returning to behaviors that have been previously outgrown. Children may demand to sleep in their parents’ bed, lose gains in toilet training, return to baby talk, or even return to the habit of thumb sucking. It is very common for preschoolers to experience a great deal of yearning for the way things once were. Sleep may become disturbed and nightmares may begin to occur. Regarding relationships, preschoolers tend to understand in self-centered terms. They see themselves as the center of the world. Consequently, some children may blame themselves for their parents’ divorce and feel guilty. For example, they may think, “Daddy left because I was bad.” If this is the case, they feel powerless in controlling the outcome. Since three to five year olds do not have a real sense of time, it is difficult for them to measure the time frame without seeing the absent parent. As a result, separations at this age are marked by anxiety. Preschoolers wonder if they will see the absent parent again. Transitions between homes maybe characterized by expressions of worry, fear, anxiety and crying as the preschooler anticipates leaving the parent they are feeling attached to at the moment. However, this behavior does not imply that they favor one parent and fear the other. It may simply mean that transitioning between two parents is hard. Adjustment problems are common from around the time of family separation and typically occur within the first two years following the parent’s divorce. These problems tend to diminish as time moves forward. With parental assistance, most preschoolers adjust to the change within their family and do not experience any negative long-term outcomes. In the next post, I will explore what parents can do to help their preschooler cope with this major life transition.